Kodak have posted the first images taken on the revived Ektachrome slide film. The film, which was announced at CES in January 2017, is yet to be released. The last factory update from Kodak had been in November. The post was accompanied by a short video which showed the new film’s packaging, aswell as colour cards, a portrait of teenage girl, a building, a tin of soup and some retro-looking polo shirts. The pics themselves looked somewhat desaturated, causing some Instagram commenters to ask if they had been put through filters. The post had drawn more than 4,600 likes and 100 comments by UK lunchtime, but there has been no further update from Kodak. 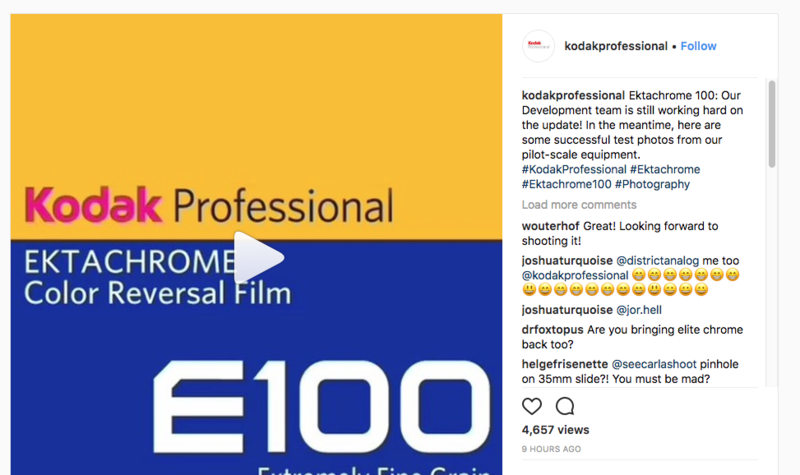 The announcement last year came as a huge surprise, considering Kodak had pulled the last of its Ektachrome range in 2012, citing lack of sales. In the meantime, Kodak also announced the return of their high-speed TMax P3200 black-and-white film, after the film had been pulled in 2012 due to falling sales.